Percy Bysshe Shelley was many things: a poet, a political radical and pamphleteer, a philosophical thinker, and a faithless husband. He was also – and this may come as a surprise – obsessed with the occult, and this fixation with spirits, demons, and dark inversions of the self was to haunt him to the end of his life. It was a preoccupation that began very early – Shelley was conjuring a world of spirits and magic and the supernatural to terrorise his younger sisters when he was not much more than ten. As Elizabeth Shelley later recalled, “we dressed ourselves in strange costumes to personate spirits or fiends, and Bysshe would take a fire-stove and fill it with some flammable liquid…” He made up ghost stories to scare his sisters, went on mysterious moonlit walks, and drew doodles of devils and monsters in the margins of his copy of Tales of Terror. He devoured the cheap horror novels of the period, and later wrote one of his own, The Nightmare, which has since been lost. At Eton, at the age of 16, he was discovered one night within a circle of blue flame, trying to raise the devil; Beelzebub apparently did not oblige. And on another occasion he wrote to a friend arranging to meet him in the holidays, warning him that he might meet on the way “Death-demons, & skeletons dripping with the putrefaction of the grave” and “at the frightful hour of midnight” awake to see “the Hell-Demon lean[ing] over your sleeping form.” And all the while he was prey to nightmares, and sleepwalking, and strange waking visions in which he could no longer tell reality from hallucination. His university friend Thomas Jefferson Hogg recalled Shelley telling him that that during one of his midnight walks he’d become convinced he could hear the devil pursuing him, rustling in the grass. It was only the first of many such ‘following figures’ that were to obsess him until his death. But were any of these spectres real, or were they nothing but the ‘shaping fantasies’ of his own fevered mind? One of the strangest examples of this occurred in 1813 – so strange that it inspired a central episode in my own novel, A Treacherous Likeness. It happened in Tremadoc, North Wales, where Shelley was staying temporarily with his first wife, Harriet. Within weeks of their arrival in the town Shelley had antagonised many of his neighbours, particularly a local landowner named Robert Leeson. On the night of February 26th, in the midst of a storm, Shelley was apparently the subject of an assassination attempt. He certainly thought it such, and more than one gunshot was heard, but no-one but Shelley saw the man who attacked him, even though the supposed assailant came back to the house a second time the same night. Even many of Shelley’s friends thought it was some kind of delusion, and years later the incident was still being referred to in the Tremadoc area as ‘Shelley’s Ghost’. Shelley always believed that Leeson was the man who tried to murder him, improbable though that suggestion was, and over the next few years this idea became almost a mania with him – he even claimed he’d seen Leeson following him in London, and once as far away as Pisa. Something was certainly persecuting Shelley, but it wasn’t Robert Leeson. Again and again in his letters and journals Shelley talks of the ‘doubleness’ of his own nature, of a dark ‘anti-self’, and once he describes himself “starting from my own company as if it were that of a fiend”. Like a ‘ghastly presence ever beside him like his shadow’, it was his own self Shelley could not escape. And with that thought, we move to the last days of Shelley’s life. In the spring of 1822 he and his second wife Mary, author of Frankenstein, moved with their friends Edward and Jane Williams to a small house on a wild and lonely stretch of the Ligurian coast, near La Spezia. The Shelleys’ marriage was by then in serious trouble, and Mary could not rid herself of a sense of foreboding, a premonition of “some impending horror”. Shelley, by contrast, was exhilarated by the landscape, and the situation of the villa right by the sea, but the terrible atmosphere in the house eventually told on his nerves, and he became prey once again, to sleepwalking and apparitions that deeply disturbed him. the strangest thing is that Mrs Williams saw him. … She was standing one day… at a window that looked on the terrace, with Trelawny…. [and] saw, as she thought, Shelley pass by the window, as he often was then, without a coat or jacket ; he passed again. Now, as he passed both times the same way, and as from the side towards which he went each time there was no way to get back except past the window again (except over a wall 20 feet from the ground), she was struck at her seeing him pass twice thus, and looked out and seeing him no more, she cried, ” Good God, can Shelley have leapt from the wall? Where can he be gone?” “Shelley?” said Trelawny, “no Shelley has passed. What do you mean?” Trelawny says that she trembled exceedingly when she heard this, and it proved, indeed, that Shelley had never been on the terrace, and was far off at the time she saw him. Less than a month later he was dead, drowned with Williams in a sudden storm as he was sailing back from Livorno. That same night his friend Lady Mountcashell dreamt of him, his face pale and melancholy, saying mournfully, “I shall never eat more”. She had no idea then, that he was dead. 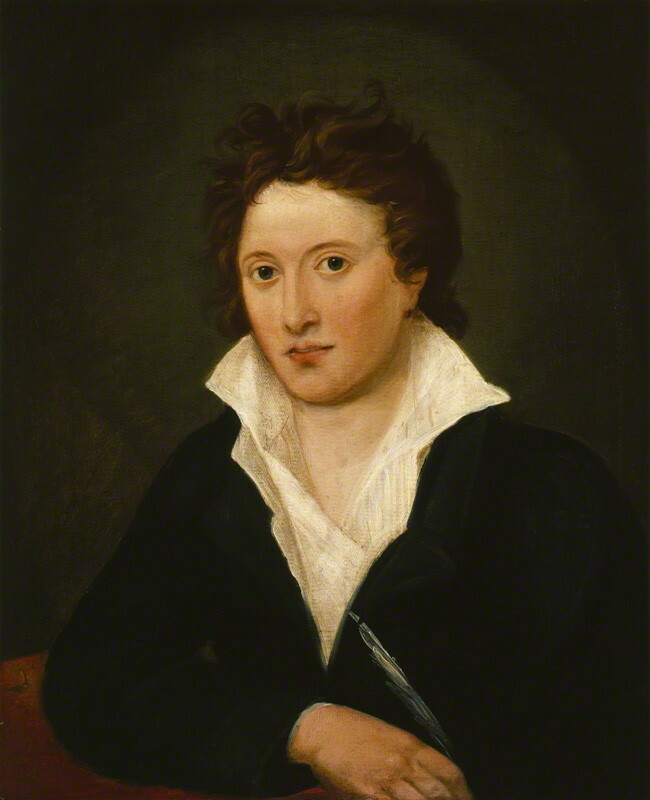 Percy Bysshe Shelley by Amelia Curran. It was ten days before the bodies were found, flung onto the beach near Viareggio. By then Shelley was only identifiable by the clothes he wore, and the book he still carried in his pocket. His face and hands had been completely eaten away. This post was originally written for the Spooky Isles website, which offers stories of the paranormal, horror and dark history in Britain and Ireland. Lynn Shepherd is the author of four novels, the award-winning Murder at Mansfield Park, Tom-All-Alone’s (The Solitary House in the US), and A Treacherous Likeness, which is a fictionalised version of the dark and turbulent lives of the Shelleys (published as A Fatal Likeness in the US). Her latest book, The Pierced Heart, is inspired by Bram’s Stoker’s Dracula. She is a trustee of The Wordsworth Trust.